I am not a native Floridian, but after living in this state for 12 years, I have developed a strong appreciation for all things Florida. Let’s face it, Florida is a VERY unique state, with 10 different regions, cultures, even accents! It stands to reason then, that the history of Florida is as unique and varied as the cultures and people that have inhabited it over the past five centuries. Diving into Florida history with your child is a fantastic journey. 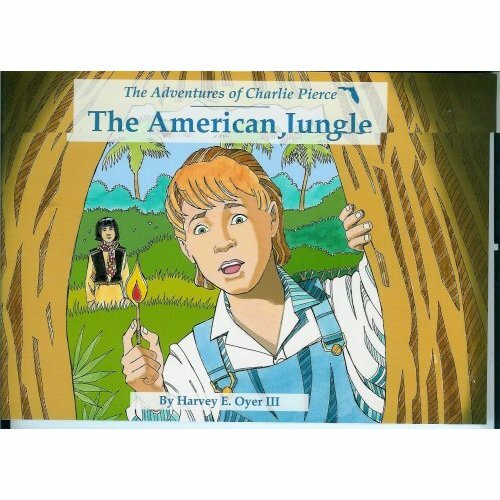 There are many ways to do this- through field trips to local battle sites, forts and landmarks, videos, visiting local history museums- and thanks to a fifth generation Floridian, Harvey Oyer III, we can discover early pioneer Florida with a new series of children’s books about one of Florida’s first pioneers, Charlie Pierce. Oyer is descended from one of the earliest pioneer families in South Florida. He is the great-great grandson of Captain Hannibal Dillingham Pierce and his wife Margretta Moore Pierce, who in 1872 became one of the first non-Native American families to settle in Southeast Florida. Oyer is the great-grand nephew of Charlie Pierce, the subject of the book series. Oyer, an avid historian and former chairman of the Historical Society of Palm Beach County, learned about his great-uncle Charlie’s adventures from stories passed down from his grandmother. In 1872 the Atlantic coast of Florida was a wild place, populated by Seminole Indians, alligators, shipwrecks and a few hardy pioneer families. Charlie and his parents moved to Florida, when he was eight years-old, to homestead and settle in what was basically a jungle. Charlie’s adventures began right away. Despite Over 40 years of wars between the Seminole Indians and the white man, Charlie meets and befriends a young Seminole boy named Tiger Bowlegs. Together they explore their surroundings and grow a friendship that helps to end hostilities between their peoples. Along the way, Tiger teaches Charlie the Seminole language, how to hunt and fish, and the ways of the indigenous peoples. Charlie and his family also encounter their first hurricanes, learn to survive in a foreign land, salvage shipwrecks, and discover Spanish treasure. Our family recently read the first book in the series, The Adventures of Charlie Pierce: The American Jungle together, and all of us were engrossed in the story of Charlie and his family. Compared to other parts of North America, there were very few pioneers in Florida in the 1800’s, therefore Charlie’s story gives us a rare glimpse of that period in history, when Florida was no-man’s land. Thankfully, Charlie kept a lifelong journal which Oyer was able to draw from in writing his books. The second book in the series, The Last Egret, follows Charlie and his friends as they travel deep into the unexplored Florida Everglades to hunt plume birds for their feathers. During the late 19th Century, the fashion rage throughout America and Europe was colorful bird feathers to adorn people’s hats and clothing. Hunters killed millions of birds in the Florida Everglades to supply the booming trade in feathers. They never imagined the challenges they would encounter, what they would learn about themselves, and how they would contribute to American history. I highly recommend Oyer’s books as a way to pique your child’s interest in Florida history. In addition to being a great source of historical information, The Last Egret also meets several Florida Sunshine State Standards . The Florida Sunshine State Standards (FSSS) are a set of benchmarks that schools are required to implement in order for students to achieve a well-rounded education. Some of those standards include learning about Florida history, and although homeschool educators are not required to follow them, it’s nice to know that this series of books is written with FSSS compliance in mind. The author’s website has free downloadable teaching tools and information to help integrate the book into your child’s curriculum. Oyer is well known for his engaging and popular presentations, and he is available to speak to homeschool groups in the state. He can be reached through his website: The Adventures of Charlie Pierce. Check out the videos below that talk about the books and ways that they are being used throughout the state to teach history & conservation.